With their 2018 Seventeen Concert “Ideal Cut” in Malaysia held last Sunday, just a day before Chinese all over the world would be celebrating the Mid-Autumn Festival (or Mooncake Festival), the Chinese members of Seventeen took the chance to wish their Malaysian Carats a happy Mid-Autumn Festival. Jun delivered a more cheery message to their fans, hoping that everyone would celebrate it happily. The8, on the other hand, nearly made their fans shed some tears as he made a heartfelt confession that despite this being a family-themed holiday (families would usually gather and enjoy mooncakes together), he himself hasn’t been home for it for years now. “I don’t mean to make anyone sad,” he quickly added, saying that he also wished their fans would be able to celebrate the festival happily. The dancer shouldn’t feel so lonely, however, since he was accompanied by 5,000 Carats (yes, that’s their fanclub name) at the concert held at Mines International Exhibition & Convention Centre on Sunday evening. Looking sleek in all black, with gold trimmings for some shiny touch on their outfits. During the three-hour long concert, fans didn’t stop screaming from the beginning to the end, their Carat Bong lightsticks (yes, their official lightstick has a name too) shining bright throughout the whole show. As scheduled, the concert started at 6pm. As purple rays bathed the stage, the boy band appeared on stage, looking sleek in matching shimmering black jackets paired with dark pants. The stage lights kept changing – visual aesthetics are important in a concert – and as red lights gave way to blue lights to match the ethereal blue background, they kicked off the concert with remix versions of “Highlight” and “Thanks”. S.Coups, Jeonghan, Joshua, Jun, Hoshi, Wonwoo, Woozi, The8, Mingyu, DK, Seungkwan, Vernon and Dino then shed their jackets for their “Bring It” stage, donning an all-black look, before switching it up again for “Flower”, this time going to the opposite end of the color spectrum with their crisp white jackets. With canes in hand, they performed a remixed version of “NO F.U.N.” and then chucked the canes out of sight as they performed “Chuck”, also remixed for the concert. SVT Leaders exuding their charismatic aura as they performed “Change Up”. 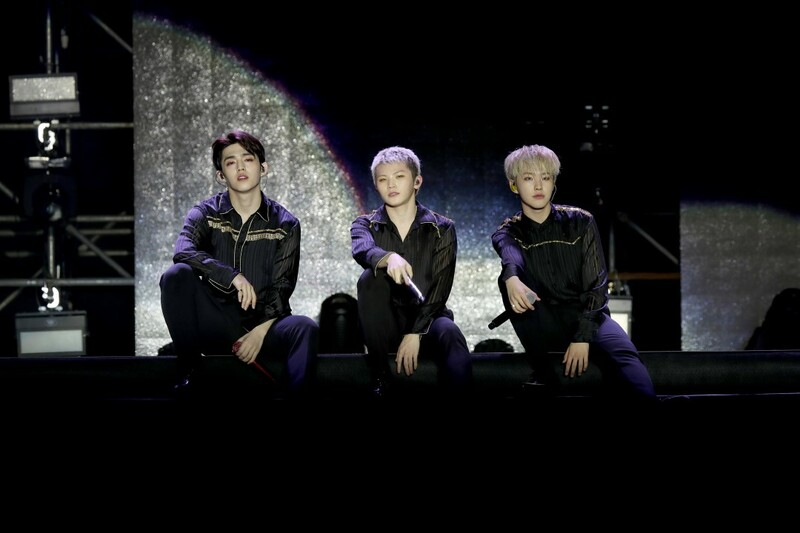 After performing “Run to You” and “Beautiful”, the rest of the members went backstage while the three-member subunit SVT Leaders (S.Coups, Hoshi, and Woozi) entertained the crowd with “Change Up”. The Hip-Hop Unit (Wonwoo, Vernon, S.Coups, Mingyu) took the stage next. Decked in colourful, bright outfits, the four members hyped up the crowd with a couple of their bass-thumping tracks. Following right up was the Vocal Unit (Jeonghan, Joshua, Woozi, DK, Seungkwan), who took over calming everyone down with their beautiful ballads, “Habit” and “Pinwheel”. The Performance Unit (Jun, Hoshi, The8, Dino) got everyone tapping their feet and bobbing their heads again with their remix versions of “Swimming Fool” and “Jam Jam”. The boyband turned the dial up all the way to ‘super cute’ as they performed “Thinkin’ About You”, wearing matching white suits, adding cute props like heart-shaped headbands and funky glasses to complete their aegyo-filled look. Their biggest prop came in the form of a white couch, which materialised on stage during their “Pretty U” performance. Being the energetic band that they are, they didn’t just sit on it, the couch was incorporated into their dance. 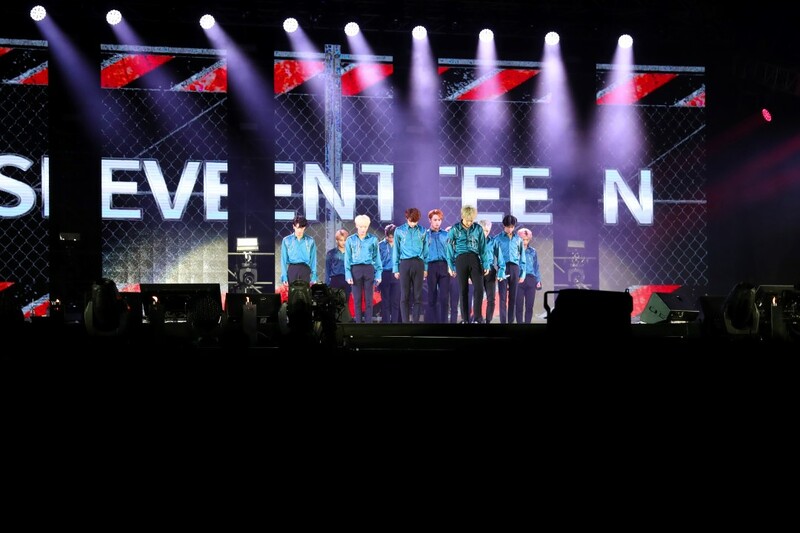 Apropos of their “Shining Diamond” track, Seventeen wore shining blue tops to perform it. Going from cute to classy, they donned matching shining blue tops for their next stage, “Shining Diamond”. Speaking of things that shine, Vernon made us of his sweet talking skills towards the end of the concert when he said that as he walked down the stage, he looked out at the sea of fans and noticed that they looked like stars. “Thank you for always shining on us,” said the Korean-American member. 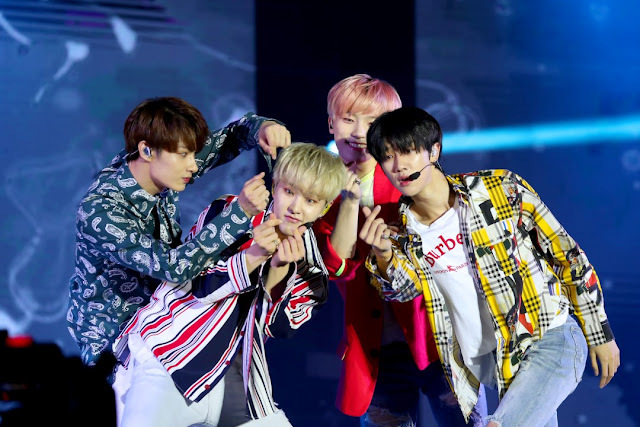 After a hilarious dance battle between Seungkwan and Dino (the main vocalist had to admit defeat to the main dancer), the boyband performed their encore stages, wrapping up the show with “Very Nice” and promises to return with their next concert. I want to send a thank to you.Your writings are so good. I can branch out with new knowledge.I wish you can update articles often.